Queen Oprah closed out the event. A reboot of a sci-fi anthology series of the same name by Stephen Spielberg. It’s had some drama thus far, with original showrunner Bryan Fuller departing from the production, supposedly due to ‘creative differences.’ The series will now be helmed by Once Upon A Time cocreators Adam Horowitz and Edward Kitsis. This was the big-name doozy with both Aniston and Witherspoon in attendance at Steve Jobs Theatre to kick things off. It’s a behind-the-scenes morning news show focusing on gender politics at the workplace that’s already got a full two-season order. Witherspoon and Aniston are producing, while Steve Carell, Billy Crudup, and Mark Duplass are slated to star. What if everyone was blind in an apocalyptic world and unable to gaze upon the beauty of star Jason Momoa? This fantasy epic also stars Alfre Woodard and comes from Steven Knight, the guy behind Peaky Blinders, and Francis Lawrence, who directed Hunger Games: Catching Fire. Anthology series from Kumail Nanjiani, creator of The Big Sick, inspired by true stories of immigrants coming to America. It’ll be written by Nanjiani and his wife, Emily Gordon, and produced by Lee Eisenberg of The Office and Alan Yang of Master of None. Introduced by Big Bird, Sesame Street Workshop has teamed up with Apple to create a coding-centric show for preschoolers with some new muppet called a...Helpster. Do you love musicals? Well, J.J. Abrams and Sara Bareilles are creating a series about what it’s like to be a struggling singer-songwriter in New York City. While Abrams is best known for high-concept shows and movies, he also co-created the young lady in the big city series Felicity. This one seems like it’ll be closer to that than Lost or Fringe. Starring Octavia Spencer, this mystery drama is based on a crime novel with the same name by Kathleen Barber. It wasn’t introduced per se on stage, but it did flash up in some of the montages. Also featured in montages was a period comedy about Emily Dickinson, starring Hailee Steinfeld—that little girl from True Grit who was recently in the Pitch Perfect movies and Bumblebee—as the titular character. Yup, another montage show. Helmed by Battlestar Galactica creator Ronald D. Moore, this sci-fi series is about an alternate timeline where the space race never ended. No word on the title just yet, but Shyamalan was not only present in the beginning montage about Filmmaking, but clips of his thriller series were rampant. Providing the funnies for Apple’s montage reel was this still untitled comedy by Rob McElhenney and Charlie Day from It’s Always Sunny in Philadelphia fame. Rounding out the montage reel is this musical new animated series from the creators of Bob’s Burgers. Toxic Labor, Untitled Mental Health Doc, and a TV Book Club? 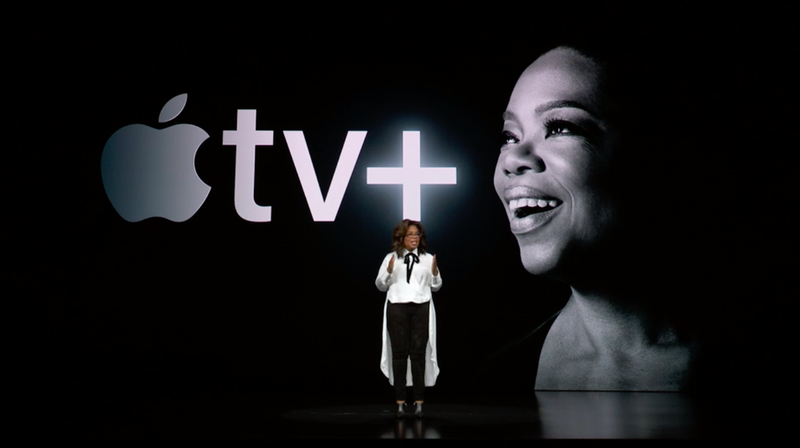 Received by a standing ovation, Oprah is not letting Apple’s reach—“They’re in a million pockets, y’all.”—get away from her. She’s got two documentaries slated for TV+, Toxic Labor is about sexual harassment in the office and the other is about mental health. Also, a book club because YOU get a book and YOU get a book. APPLEEEEEEEEEEEEEE~~~!